Sherie Costa is a solutions consultant for Blume Global, based out of our Wellesley office near Boston. She joined Blume Global in 2008 and has a wealth of knowledge and experience in the supply chain industry, making her an ideal person to work closely with our customers to support their needs and help with their implementations. 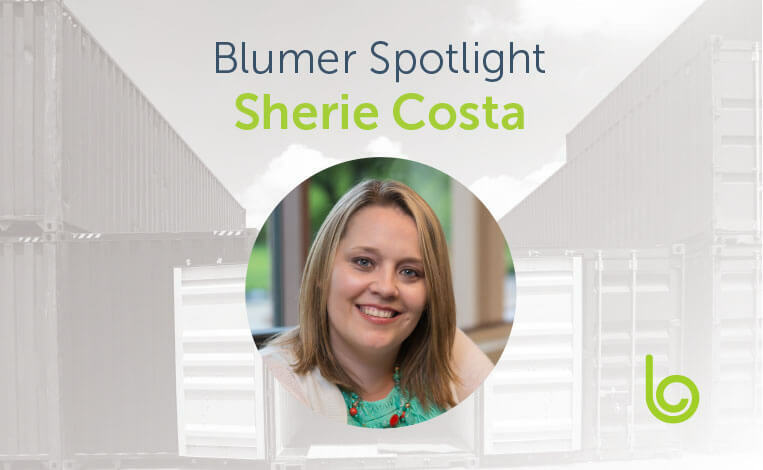 Here’s our Blumer spotlight interview with Sherie about her experiences at Blume Global and what she’s been working on outside of work. You joined Blume Global over 11 years ago. What are some of the major things that are the same as when you joined and what has changed in the last year or so? Since I joined Blume Global (formerly REZ-1), lots of things have changed. We have redesigned our entire asset management system, expanded our product offerings, added a number of new offices, more than doubled the number of employees and even changed our name. With all of the things that are different, there are some things about Blume Global that haven’t changed. On my first day at Blume Global in 2008, I was greeted by a group of fun, intelligent and quirky individuals who were passionate about intermodal (I didn’t even know what intermodal was then). Eleven years later, the team has grown and changed but the excitement for what we do has not. They make it fun to come to work every day! What moment or experience really encapsulates your time at Blume Global? At that moment, that didn’t make sense to me. But she was right—that day did come. Today, it’s almost impossible to not see the industry happening around me and to not wonder how we might be able to change it. It’s kind of a joke that once you start working in transportation and supply chain that you never leave—and I can understand how that could happen now. You’ve had a lot of customer interaction over your career with Blume Global. Can you tell us a customer story that really sticks out? I was pulling a few internal folks onto a call with one of our customers to discuss a big analytics project. The sponsor of this project was a key influencer at his company. Due to the size of the project and the audience, there was lots of anticipation on how the call would go. All of the concerns went right out the window when the client sponsor logged into the web conference with the name “President of the Sherie Costa Fan Club.” This particular project ended up being a big success and went a long way to help the customer optimize the utilization of their fleet. Looks like you’re studying to get your M.S. at Northwestern in Information Design and Strategy. How are you juggling working and getting your graduate degree? I’m in my first semester of my master’s degree, having been out of school for, well, a bit. It was difficult to get back into the swing of things. I spend lots of time on airplanes and in airports, and I have been using that as my opportunity to study and get my homework done. Why did you choose information design and strategy? The information design and strategy degree really attracted my attention because I love the idea of making meaningful data consumable to the non-analysts of the world like myself. If we can share the right data with the right people at the right time, we can really help facilitate changes in our industry. How has Blume Global been supportive of this? Blume Global offers tuition reimbursement, which is incredibly helpful. In addition to the financial assistance, the team at Blume Global was a huge part of my admission to the program. When I asked some members of the team to help me with my letters of recommendation, there was no hesitation. My acceptance wouldn’t have been possible without them. You’ve done some volunteer work with Horizons for Homeless Children. Can you tell us a little bit about your experience there and why you volunteer there? During my tenure as a P.A.L. (playspace activity leader) at Horizons for Homeless Children, I was fortunate enough to be able to spend a few hours a week directly engaging with the children in the program. I believe that no matter the circumstances we all come from, every child deserves the opportunity to be happy, healthy and successful. The program focuses on how the impact of playing can reduce the stresses of homelessness on children and help facilitate the continuing development of functioning skills. Some of my most memorable experiences with the children were seemingly small from the outside but really made an impact on me. When I would show up to the playspace and the children had made me pictures or crafts at school, that made me smile from ear to ear. It’s an amazing feeling to know that you have made enough of an impact on a child that they think of you when they are making special projects at school. I enjoy attending hockey games and go to a number of Boston Bruins home games every year. I’m on a mission to see them play in every arena in the N.H.L. In addition to hockey, I enjoy seeing live music. My musical tastes haven’t evolved out of the 90s, though. I also love to pop into local breweries during my travels and taste the craft beers of the area.